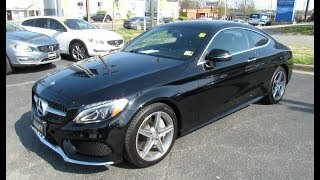 Giving facelift to the 2012 C Class, Mercedes introduced its C Class Coupe and now they rolled the dices at the 2015 Frankfurt Motor Show by unveiling the all new Mercedes Benz C Class Coupe 2017. As claimed to offer more interior space and is also lighter in weight in comparison to the predecessors. Well this also implies that there will be bit of boost in the performance too. 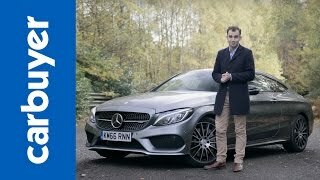 Let us have a look at the review of Mercedes Benz C Class Coupe 2017 to know in detail about it. Talking about the interior of Mercedes Benz C Class Coupe 2017 for once might feel little less in space due to its sloping roof but due to longer wheelbase and better packaging, the model offers sufficient space to its buyers. Overall the Coupe version is very much identical to sedan; the primary difference comes through the console that has a newly designed gear lever for manual transmissions. Talking about the tech gadgets and the upholstery they too are carried forward from the sedan sibling. So rounding up the interior details of Mercedes Benz C Class Coupe 2017 I would say, it is just the door version of the four-door sibling. 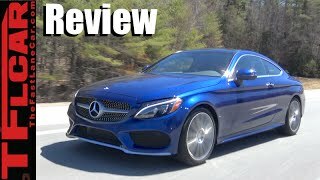 The first glance of the exterior of Mercedes Benz C Class Coupe 2017 will undoubtedly recall the 2015 S-Class Coupe but a closer look will reveal some changes. Starting with the front fascia, the model has grille and headlights identical to that formulated in the sedan version however the side look gives more ‘concentrated’ appearance and brings that ‘for a change’ feeling in your mind. Moving towards the rear end, things are very much similar to the S-Class version and this includes the taillights and bumper. However the number plate gets a new position (which is least noticeable). So in all talking about the exterior details of Mercedes Benz C Class Coupe 2017 I would just say, it is amalgamation of the sedan sibling and the S-Class version. 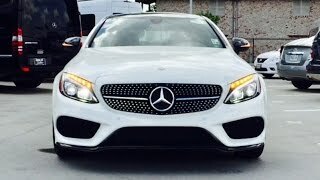 The Mercedes Benz C Class Coupe 2017 comes in two different variants, namely; C300 and C400. The former is powered by a 2.0 liter turbocharged engine generating total output of 241 hp and peak torque of 370 nm. 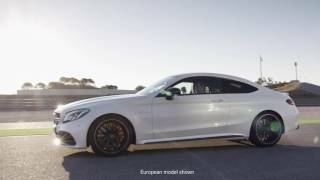 The performance figures of Mercedes Benz C Class Coupe 2017 C 400 and C300 are not yet shared but we expect them to be out very soon.